Microsoft Dynamics CRM 4.0 is Microsoft’s latest version of its CRM tool within the Dynamics line of business software targeted at small to medium sized businesses (SMB). When Dynamics CRM 4.0 was released, it marked the third generation for the product line (version 2 was skipped entirely) and delivered many significant improvements. Prior versions fell short of the expectations of many industry analysts and a large share of mid market and enterprise businesses. Dynamics CRM 4.0 is a balanced CRM offering for the average small or mid market business that are committed to using Microsoft technologies and require strong Sales Force Automation (SFA ) but have only modest needs in the customer service and marketing areas. 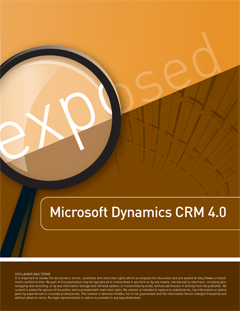 Enterprise-sized organizations and mid-sized companies with complex marketing or customer service needs should evaluate Dynamics CRM 4.0 carefully to determine if the functionality is adequate to meet their requirements.